If you’re an American, the odds of you being familiar with celeriac (aka celery root) are slim. This is a tragedy! They know all about it in Mediterranean and European countries, so maybe it’s a complex conspiracy to keep more of it for themselves. Celeriac, as the name suggests, is the root portion of a variety of celery. It has a strong celery flavor when raw, but it mellows out into a pleasant mild celery flavor when cooked. It’s not very pretty, but when you peel off the outer skin, it’s similar in color and texture to potatoes. In fact, you can use it in any way you’d use a potato. You can use it in soups or stews, mash it, french fry it, or make it au gratin. Unlike potatoes, however, it’s low in starch and calories. It’s also high in fiber, vitamins K and C, and several minerals. It doesn’t get floury when cooked, and so keeps a nice texture in dishes. This particular recipe is for a low-carb celeriac au gratin. It’s large, using 9×13 casserole dish, which is enough for about 8 servings. The leftovers are great, but if that’s too much for you, just halve the recipe and use a smaller baking dish. 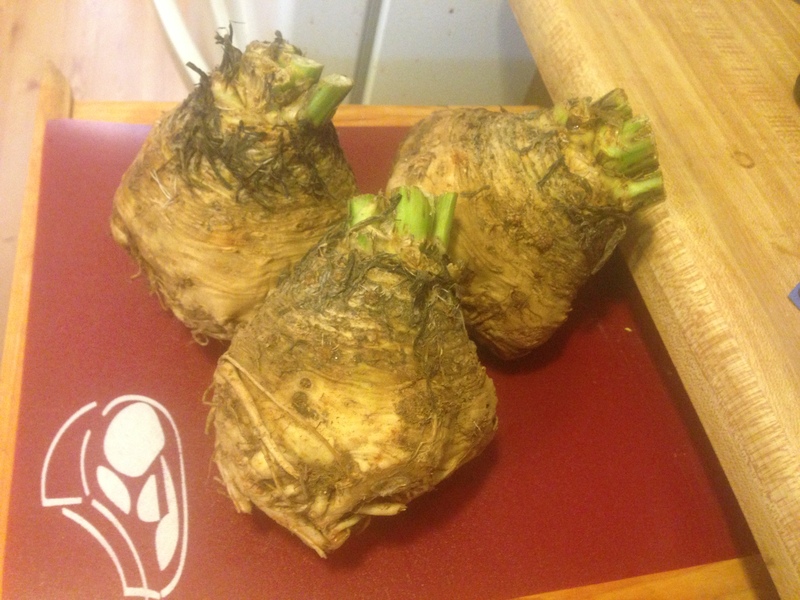 2 large celeriac, or 3 medium, or 4 small. They can vary in size just like potatoes. Pre-heat your oven to 350º. First, using a paring knife, remove the peel from the celeriac. Cut them in half lengthwise, and then in half again lengthwise. Slice the pieces in about 1/8 in. slices. Put all the slices in a saucepan, cover with water, bring to a boil and cook for about 10 minutes, or until tender. Drain the celeriac and set it aside. This part can be done ahead of time. Thinly slice the onion, and sautee it until it’s browned, but not quite caramelized. Towards the end, add the garlic to the pan and finish sauteing it with the onion. Set them aside when they’re done. The next part is the creamy sauce. Separate the cauliflower into florets, and steam them until very soft. This can be done in the microwave while you’re doing the other stuff. Drain the cauliflower, and put it in a large bowl (I used an 8 C pyrex measuring cup to make it easy to pour out when ready). Add the heavy cream and Parmesan cheese, and blend it well. If the cauliflower is still hot, the Parmesan should melt and combine. If it’s not combining well, heat it in the microwave for a few minutes until it’s hot. Season with salt and pepper to taste, and then sprinkle a little xanthan gum over the top and mix until it’s well blended. Keep adding xanthan gum and blending until the sauce thickens, but don’t over-thicken or it will be unappetizing. Add the onions and garlic to the sauce. Now you’re ready to assemble the dish. 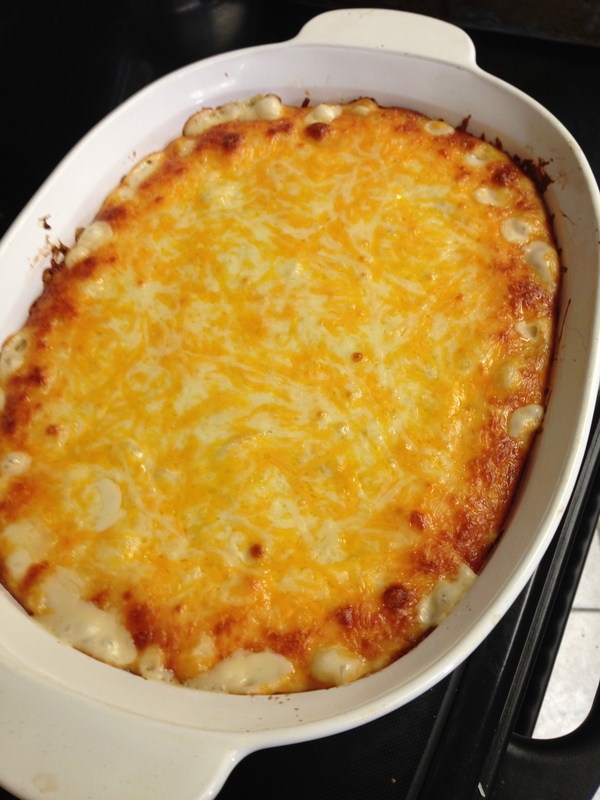 Butter a 9×13 casserole dish. Put a single layer of celeriac in the bottom, sprinkle with salt and pepper, cover with a layer of sauce, and then sprinkle with shredded cheese. Keep layering in this order. Use extra cheese on the top. Bake at 350º for 45 minutes and enjoy.